This week Nintendo revealed its plans to start shutting down the Miiverse near the end of the year, and it’s going to affect a lot of games. One of those is Super Mario Maker. The 2D platformer design-em and play-em game was propped up by community interaction, which will all but disappear when the Miiverse lights are switched off. It’s a shame, because it doesn’t leave players much time to comment on what must be one of the most impossible player-created stages thus far. 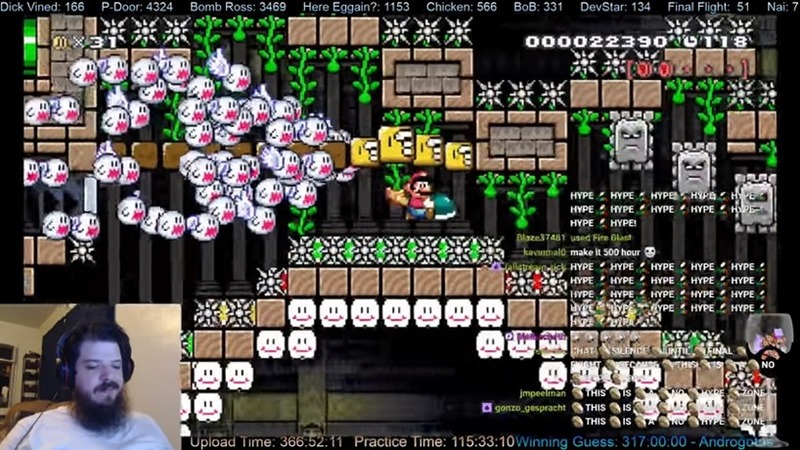 Building gruelling platforming challenges has been the allure of Super Mario Maker for some time, but few have taken it to the extremes that Failstream has. As reported by Kotaku, Failstream spent a good portion of 20 in-game days both designing and trying to best his own “impossible” stage in the game, without using any exploits to make it so. Super Mario Maker requires all creators to finish their own level before they’re allowed to upload it, but I don’t think even Failstream thought it would take over 400 hours of attempts to do it. But it was done, and the response is just euphoria in a bottle. Check out the insane run below. The course is a gruelling challenge of both item management and finesse. It tasks players with using Koopa shells, Power blocks and bombs to make last minute leaps to safety, while also using the Cape in a way that only true Mario Masters could hope to do. It’s lengthy too, and Failstream only hit the end with a second to spare in his perfect run. That leaves no margin for error, but you know now that the stage is certainly there to be beaten. And if you want to take a crack at it, you can. The stage ID is 154E-0000-0358-C2FB, so fire up that Wii U and try give what is easily the hardest Mario Maker stage I’ve seen a go. I’ll not tell you how long it should be before you give up, because it’s something Failstream never did.